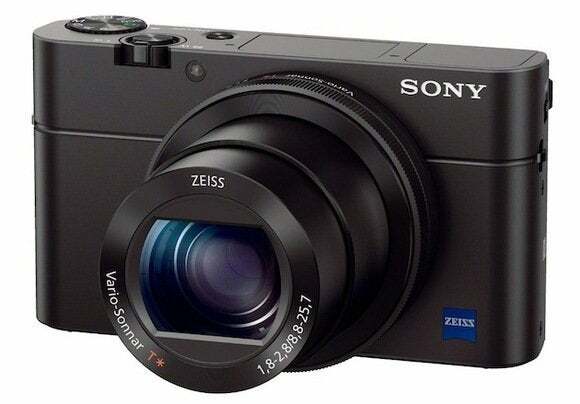 Sony is expanding its lineup of RX100 Cyber-shot cameras with a new addition that sports an electronic viewfinder. The RX100 III is a compact digital camera designed for users who like to point and shoot without fussing with many settings. The camera’s new features include a Zeiss Vario-Sonnar 24-70 mm F1.8-2.8 lens, which has a wider aperture that can take in about twice as much light as the preceding RX100 and RX100 II models when it’s at the 70 mm focal length. The wider aperture allows for blurrier backgrounds when taking portrait shots with a shallow depth of field. “The RX III has kept the pocket-size compact form factor but has more features including the new lens and the viewfinder,” a Sony spokesman said. The pop-up electronic viewfinder, an optional accessory on the previous model, has a 1.4 million-dot OLED screen that lets users frame shots in the style of a traditional rangefinder camera. It also has a coating that prevents glare when shooting in bright light. A sensor on the screen can detect when a user’s eye is near, automatically switching between the display on the monitor and the viewfinder. The 3-inch LCD monitor itself can swivel 180 degrees, which is useful for taking selfies. While the RX100 III has the same CMOS image sensor as its predecessors, the 20.1-megapixel Exmor R, it packs Sony’s BIONZ X image processor, which comes from the manufacturer’s higher-end cameras and is designed to capture shots better in low light with an ISO range of 125 to 12800. The RX100 III is the first Cyber-shot to record HD video in the XAVC S format, which requires an SDXC card, and files can be saved at a rate of 50 megabits per second. Sony said the camera will be available in June for about $800.